Where are you going? Did you get there? These are common questions for a road trip, and they’re just as relevant to your digital projects. Are you working with purpose? If so, how will you know if you’ve achieved it? When it comes to digital work, our secret Swiss army knife is analytics. It includes the measurement, collection, analysis, and reporting of web data for the purposes of understanding and optimizing web usage. In other words, the study of web usage behaviors. If we can define measurable goals, then we can finally answer the question: did we succeed? Whether you’re an expert needing a refresher or a new-comer getting your feet wet, we’ve found that having a basic understanding of commonly used terms is important. Goal – An observable and measurable result having one or more objectives to be achieved within a more or less fixed timeframe. Impression – the number of times a piece of content (like an online ad) is seen; the views. Check out Business Dictionary for a full list of definitions. With a basic understanding of the terms used to describe and discuss analytics, you can now dive into analytic and metric reports with context. Understanding what the data associated with these terms means for your unique organization (your organization’s goals and KPIs) is the next step in gaining insight. 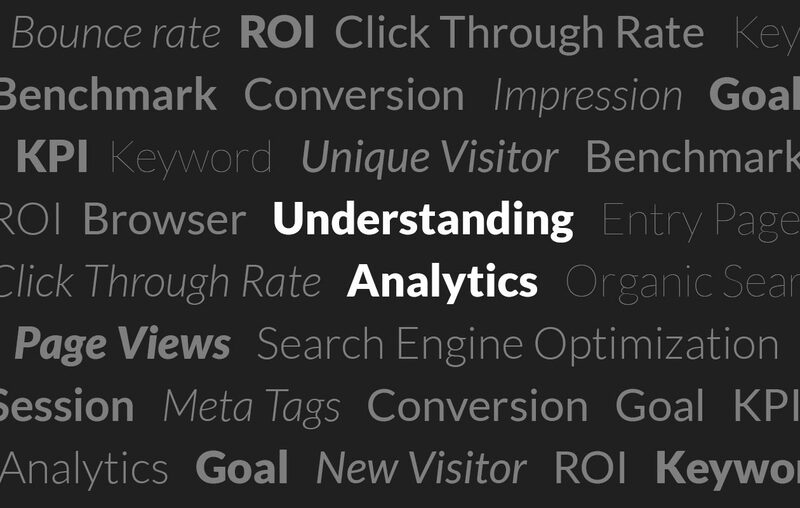 Check back for Part 2 on our Understanding Analytics series about how you can use analytical data to guide discussions and decisions!